I seized on an opportunity to be dropped off in Guisborough and run home and, as the weather was dire, decided to stick to the woods and go over my old training grounds. It’s almost thirty years since I lived in Guisborough but while the main forest tracks are the same much has changed under the trees. Woodland which was just impenetrable scrub is now mature birch and large tracts have been felled. I used to have a small circuit in the woodland at the foot of Kemplah Bank. It had mature trees even then covering a stony forest floor on which even brambles and bracken failed to establish roots. Someone has, a couple of years ago I am told, been hard at work landscaping and creating a personal sculpture garden. 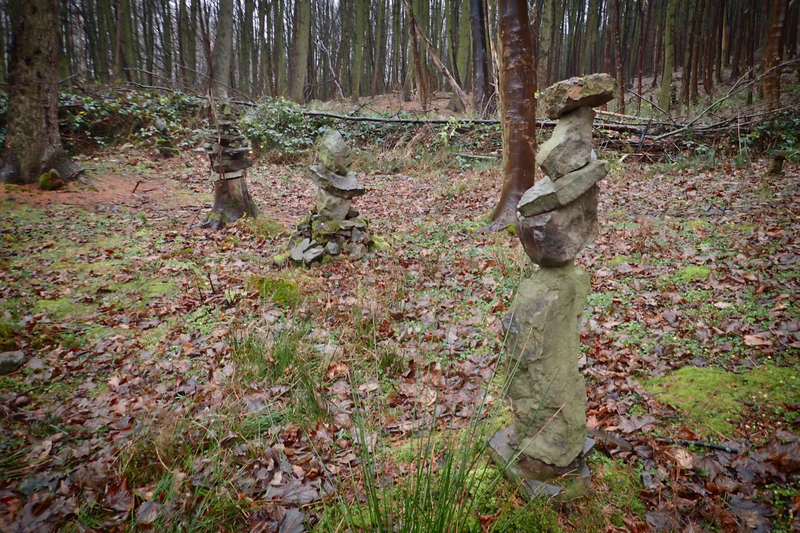 Many cairns and stone towers have been precariously built along with kerbed paths and wood carvings. These three stone towers are protected by a corral of “dead” hedging, fairly rudimentary but effective. This is more than just kids’ work, truly a labour of love by someone. I’m actually more impressed than some of the work on show at the Yorkshire Sculpture Park. Amazingly the constructions have resisted the temptations of adolescent destructive tendencies. The whole effect was a little eerie although not quite the Blair Witch Project. Kemplah is a strange sounding name, one source records it as ‘Kempclive‘ or ‘Kemplei‘ meaning Kempi’s cliff. Kemplah Woods, Green Hill, Ash Bank, Shale Heaps – my regular haunts with my Border Collie (1975–1990), must have bumped into you more than once I reckon. Been home many times since and nipped up Highcliff but never up the little path into Kemplah Woods, so great to see the picture. Younger days, I was fit then. Prime time definitely, I’m a lot slower nowadays. Next PostNext Deck the hall with boughs of holly ….